More than just another mounted warrior, the cavalier is the iconic knight, whose excellence in armes, horsemanship, and dedication to the chivalric code set him apart from other warriors. Blending the best traits of nobility with martial prowess, the cavalier is an invaluable addition to any adventuring party. 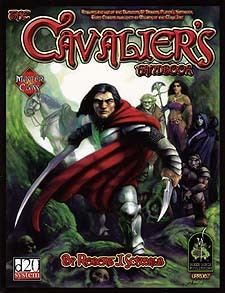 The Cavalier's Handbook, the newest in Green Ronin Publishing's Master Class series, marks the return of the popular class from the days of 1st edition. From knights of Arthurian legend to elven cavaliers, this book gives you all the tools needed to bring this exciting class into your game. * The cavalier base class for both fantasy and modern campaigns, fully supported by seven new prestige classes including the holy crusader and the knight of infamy. * 40 new feats including Mounted Massacre, Paramour, and Sundering Charge. * Rules for social class and family history. * Details on tournaments and jousting. * A detailed look at heraldry, including randomized tables for building a heraldic crests for characters of any class. * Brand new options for playing apprentice characters of any classes. * Ten all new steeds like the Crag Crawler and the dreaded Ebon Courser. * Dozens of new magic items. * Full rules on building knightly orders and guidelines for designing your own chivalric organizations. With The Cavalier's Handbook, you can take your games to new heights of chivalry! Do you have what it takes to be a cavalier? Requires the use of the Dungeons & Dragon Player's Handbook, Third Edition. This product utilizes updated material from the v.3.5 revision.